I love playing games. I always have. I haven’t been able to play card games with my kids yet – Go Fish, Old Maid, Uno, etc. Why? They can’t hold the cards. Today’s craft is the solution. Do you have kids that you are excited to usher into the card playing the world with your kids but have felt limited because they can’t hold the cards? 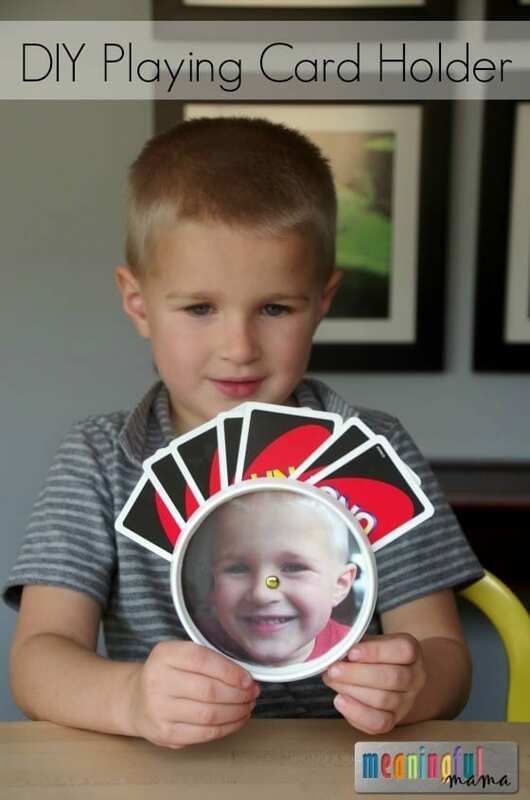 This simple playing card holder for kids is a great solution! I originally made these with my girls (pictures below), but I recently made one for my son so that I could give you a better tutorial. I also have added a YouTube video to show you how easy it is to create these card holders for your own kids. I hope you are excited to be able to begin playing cards with your kids. There are great learning benefits associated with games, and it’s a time of intentional interaction that is invaluable. 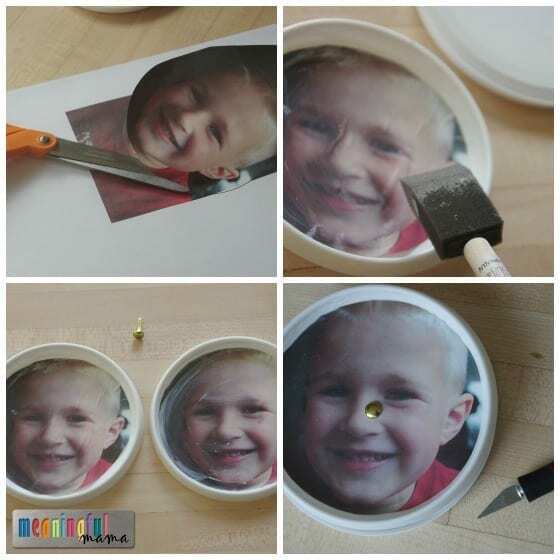 Cut out the picture of your kids to fit the inner circle of your lids. 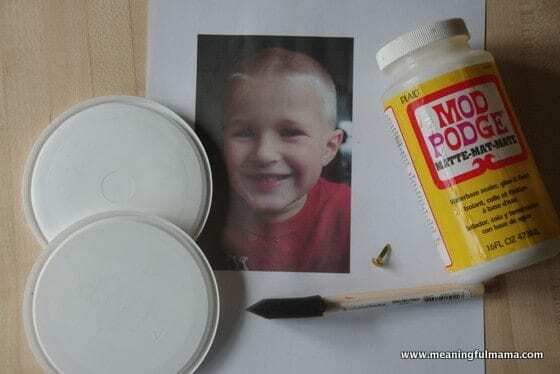 Have them spread mod podge or glue onto the plastic lids lids. Stick down the picture. 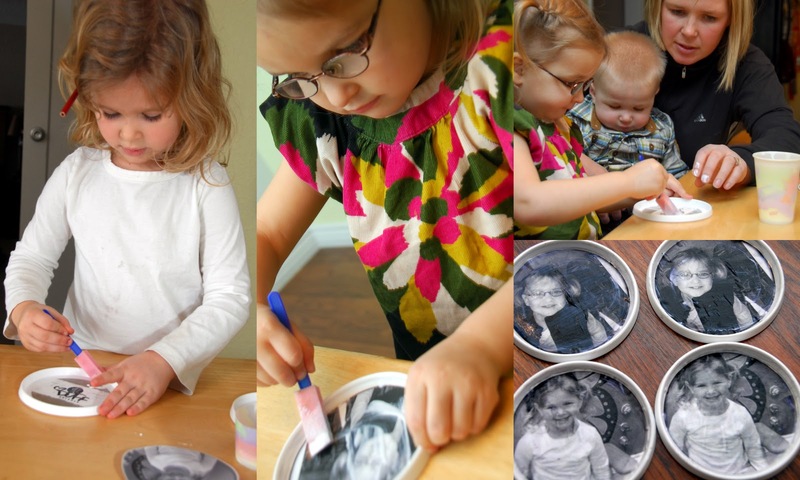 Next, have them mod podge or glue the top of it. When dry, poke a hole in the center of the lids with tip of scissors or an Exacto knife. Parents should do that part. Fasten the two lids together with the metal paper fastener. 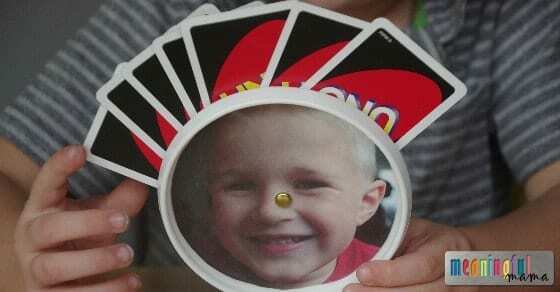 Now you can play cards with your kids. Thanks for sharing so many creative ideas. What a great idea! My kids will love this, thank you! Glad you’re going to do it. Cool to check our your site too. My little ones need something like this! Uno is kind of becoming a joke! I hear ya, Laurel. We play go fish with cards on the ground and everyone’s hand exposed. Not any more. This is such a smart idea. love it! Thanks for checking it out. I just linked up on your page. I am working on creating a link party page on my site and will make sure to include you. Now that she can hold the cards, my daughter has asked to play every day. Thanks for checking in with me. Let me know if you end up making it. This is a great idea. It would be a conversation starter at our card game night. I’m going to have to try this out. Thanks for sharing! Wow great idea and super clever solution! Thanks for linking it up to A Crafty Soiree, I’ve featured it in this week’s! I used the lid off of my Activia (yogurt) and cut the bottom off of it and stuck it together with a metal paper fastener! Works great!!! and only took me 2 min to put together! Thanks for the inspiration! Yay! I’m so glad. We made this a couple years ago now and the youngest ones still use them. I think without them, we wouldn’t have been able to introduce card games so early on in their lives. Have fun with it! I’m so excited. My granddaughter has hemiplegia and can’t use her right hand (arm or right leg) she loves to play cards but can’t hold them. I’m going to make this for her for Christmas!!! Yay! this brings so much happiness to my heart. I’m so happy you found this solution and really hope it works for you.